Bumpers R Us is Fresno, CA’s preferred auto body shop and part supplier. Come to us for light bodywork repairs for both plastic and metal bumpers. We also carry both new and used auto body parts including bumpers, fenders, tailgates, doors and much more. We welcome late-model vehicles from 2000 and newer, providing impeccable service you can count on. We’ve been in business for more than 25 years! We’ve moved locations in the past, but our staff has remained steadfast to our mission of delivering superior service. Need a replacement auto part? We carry used OEM parts that are marked as much as 50% lower than manufacturer-direct or dealership prices! We’re happy to provide discounts to customers who donate to a Bumpers R Us preferred charity. It’s our way of giving back to our local community! Our shop is tri-lingual! We’re fluent in English, Spanish and Russian, ensuring seamless communication between our staff and customers. We specialize in bumper repairs and part replacements for late-model vehicles, from 2000 and newer. We also work on older models on a case-by-case basis. If you’re driving around with a damaged bumper as proof of a recent accident, it’s time to erase this damage and restore your car’s appearance to perfection. Bumpers R Us is ready to put in the work, delivering bumper repair and reconditioning services to late-model vehicles, regardless of the level of damage. Our auto body shop in Fresno, CA is equipped for both metal and plastic welding, allowing us to resolve cracks, dents and other bumper damages quickly and flawlessly. For more intense damages, look to us for a replacement bumper that will restore the integrity of your front-end. We even do headlight restorations if yours have been damaged! By specializing in bumpers, we’re able to perform work faster and at a higher caliber of quality than the competition. Moreover, our car body shop in Fresno, CA is also your destination for used auto parts at great prices! Don’t forgo the cost of repairs on your vehicle because the cost of replacement parts is too expensive—instead, visit us, where you’ll find used OEM parts as much as 50% off MSRP! Come to us for bumpers, fenders, tailgates, doors and more, installed perfectly to repair your ailing vehicle. 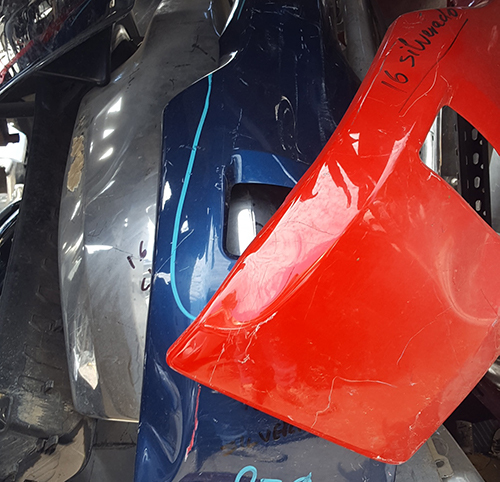 Stop by today and let us transform your mangled bumper into a like-new appearance that restores the value, appeal and integrity of your car. Don’t let a cracked bumper remind you of a fender bender that’s a long time behind you. Get your bumper fixed and any replacement auto parts you may need at Bumpers R Us!